A 67-mile driving tour with many stops that travels through the desert to the mountains and back to the desert again. Background: Ranging from a few hundred feet above sea level to over 5,000 feet in the Idyllwild area, the 67-mile Palms to Pines Scenic Byway showcases an amazing diversity of habitat and wildlife. The scenic driving tour climbs from the desert through the Santa Rosa and San Jacinto Mountains, before descending again to the desert. The route passes through a series of areas preserved for wildlife, ranging from desert oases to sprawling forests flanking snow-capped mountains. The route includes parts of the Santa Rosa and San Jacinto Mountains National Monument, San Bernardino National Forest, and Mount San Jacinto State Park. Drivers can pull off the winding and often steep road at numerous pull-offs or lookout points. The opportunities for birding, botanical observation, hiking, nature photography, and general wildlife viewing are outstanding. Geologists and astronomers will also be impressed. The Habitat: The Palms to Pines Scenic Byway is a mountain island of biodiversity surrounded by the Colorado portion of the Sonoran Desert. The effect of altitude on ecosystems is readily apparent as one ascends Highways 74 or 243. Rainfall in the lower elevations is relatively low and temperatures range from extremely hot and dry in the lower elevations in summer to very cold and snowy in the upper elevations in winter. Close to a dozen plant communities or ecosystems are represented along the Byway, including Dune, Palm Oasis, Creosote Scrub, Riparian, Desert Wash, Rocky Hillside, Chaparral, Pinyon-Juniper Woodland, Oak Woodland, and Pine Forest. One of the special features of the Byway is the ability to experience all of these communities and their varied wildlife in a single day’s drive. It’s like taking a trip from Mexico to Canada! The Experience: You may drive the Byway beginning either in Banning or Palm Desert. This description begins the tour in Banning. From Interstate 10 in Banning, take Highway 243 south. The two-lane highway 243 weaves ascends? through the brushy, forested San Jacinto Mountains, with recurring vistas of 11,500-foot Mount San Gorgoinio (the tallest mountain in southern California). You may see California ground squirrels, coyotes, gray foxes and occasional bobcats along or near the road. At mile #, you pass by Lake Fulmor, a home to mountain quail, mountain chickadees, and purple finches. Watch above the lake for the rare black swift in summer. At mile #, stop at the Indian Vista Overlook. The surrounding chaparral and oak woodlands may produce views of mule deer, acorn woodpeckers, western scrub jays, and towhees. Check at ground level for lizards, including western skinks, alligator lizards, and coast horned lizards. At mile #, visit the Idyllwild Nature Center, where you learn about mountain ecology, Cahuilla Indians, the history of the San Jacinto Mountains, or walk on three miles of trails. Continue to the picturesque town of Idyllwild, watching the trees for western gray squirrels, white-headed woodpeckers, and Steller’s jays. A U.S. Forest Service Visitor Center and the headquarters of the Mount San Jacinto State Park are located across the street from one another just as you enter the town. At mile #, you’ll arrive at Mountain Center. From here continue south on Highway 74 through scenic Garner Valley and watch for western bluebird nesting boxes placed on roadside trees. At mile #, stop at Lake Hemet. Great blue herons and Caspian terns are regulars at the lake, which is also a winter destination for Canada geese, American white pelicans, and other waterfowl. A pair of bald eagles has taken up residence in the pines bordering the lake. White-tailed kites occasionally hunt the nearby meadows, where you may also find western meadowlarks and California quail. Look for large, noisy flocks of pinyon jays along the highway. At mile #, the pinyon pines begin to disappear and are replaced by agave and yucca as you reach the Cahuilla Tewanet Overlook. The viewpoint is wheelchair accessible and can be reached at the end of a 100-yard long paved interpretive trail. Here you will enjoy views into Deep Canyon. Listen for the flute-like song of the Scott’s Oriole, a flashy black and yellow bird common in the area. Golden eagles, prairie falcons, and peregrine falcons nest on the canyon walls and may be spotted hunting or flying to the nest. You are now in the Santa Rosa and San Jacinto Mountains National Monument. The Monument preserves no less than 252,000 acres and is a destination unto itself. It is almost entirely wilderness, meant for hiking rather than driving, but the Byway travels through much of the area. Although these ranges spread close to such desert communities as Palm Springs, Palm Desert, and Banning, they are green and well-forested. They are also home to a number of rare animal species. The desert tortoise is protected here as well as a declining population of the endangered Peninsular Bighorn Sheep. The slender salamander is another rare animal that lives within the Monument. Several sites in the mountain ranges have been occupied for centuries and archaeological finds are scattered throughout the region. Among these are the Clark Lake Petroglyphs just east of Rockhouse Canyon’s mouth and the Martinez Canyon Rockhouse within the Santa Rosa Mountains Wilderness Area. Perhaps even older, natural hot springs bubble not far from the base of the San Jacinto Mountains portion of the Monument. You may see a complete description of the Monument (site ###) by clicking on the link. popular place for tourists and locals to park and view the expansive Coachella Valley. At mile #, you begin the steep descent into Palm Desert. Use the pullouts?? to scan the rocky ledges for endangered Peninsular Bighorn Sheep. At mile #, you reach the bottom of the seven-level hill [unclear what 7-level hill is, explain]. Stop at the Santa Rosa and San Jacinto Mountains National Monument Visitor Center, which provides information about the area’s natural history, cultural resources and recreational opportunities. At mile #, finish up the trip at the Living Desert (see site ###, or click on this link), a wildlife and botanical park that features many species that you may not have been able to see during the drive, including bighorn sheep. Wildlife and Where to Find It: At highway overlooks, visitor center, and trails. Along the sometimes steep and winding road, use pullouts or scenic overlooks so you can safely watch for wildlife and enjoy the scenery. Birds of prey, deer, small mammals, and predators can be seen year-round. Wildflowers bloom in early spring at low elevations, and in summer at higher elevations. Use the previously described mile-by mile driving tour for clues about the changing array of wildlife and where to find it. The wheelchair accessible interpretive trail at the Cahuilla Tewanet Overlook is provides [what kind of interpretation??]. The Indian Vista Overlook offers an excellent opportunity to scan the oak trees and brush for mule deer, acorn woodpeckers, and towhees. Lizards may be basking in the sun near the parking area.??? Lake Hemet is a municipal reservoir and popular camping, boating, and fishing site on Highway 74 that attracts many resident and wintering waterfowl. You may also spot nesting and hunting bald eagles during [insert seasons]. High probability of seeing bald eagles, waterfowl, wading birds, and songbirds year-round. . Viewing Tips: Bring binoculars as views may be distant. 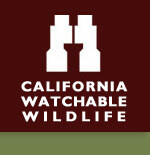 Use wildlife guides. Take advantage of nature or visitor centers along the route to familiarize yourself with local species. Don’t rush: Wildlife may leave if you get out of your vehicle, but may return if you remain quiet. Site Notes: Allow 6 to 8 hours to complete the Scenic Byway tour. Distant views may be affected by summer smog. Roads are paved and open except during winter storms. ROADS ARE WINDING AND STEEP. PLEASE USE PULLOUTS FOR VIEWING. Nearby Viewing Sites: Living Desert Botanical Garden and Wildlife Park, Santa Rosa and San Jacinto Mountains National Monument Visitor Center. How to Get There: From Interstate 10 at Banning, take Highway 243 south through Idyllwild. At Mountain Center, turn left (east) onto Highway 74 (the Palms to Pines Highway). Drive east to Palm Desert. Continue on Highway 74 to rejoin Interstate 10 or turn left (west) on Highway 111 to go through Palm Springs before rejoining I-10. OR: From Palm Springs take Highway 111 east to Palm Desert, then Highway 74 west climbing into the Santa Rosa Mountains. At Mountain Center, take Highway 243 north to Banning and Interstate 10.